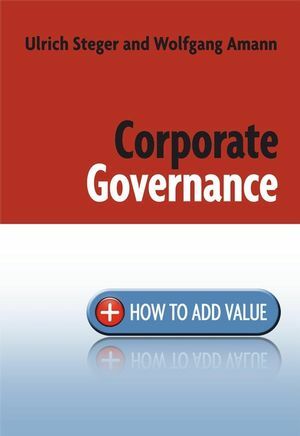 This book present the value school of corporate governance, outlining a multitude of areas where corporate governance could add real worth, and showing how this can be put into effect. No “one-size-fits-all” model emerges as a solution. Rather, the insights in this book take idiosyncrasies and dynamics over time into consideration. They consider the main issues and their real causes, ownership settings, country settings and new developments in corporate governance research and practice. International focus places emphasises on typical patterns, predicament and solutions instead of national laws. Points are illustrated with in-depth case studies and highlighted learning nuggets. Alerts the reader to typical dilemmas and traps in attaining the goal of value creation, whilst also pointing to promising avenues forward. Ulrich Steger holds the Alcan Chair of Environmental Management at IMD and is Director of IMD's research project on Corporate Sustainability Management, CSM. He is also Director of all Daimler Chrysler Partnership Programs, the Allianz Excellence Program and the Yukos Program. In addition, Professor Steger heads IMD's Global Corporate Governance Research Initiative. He is also a member of the supervisory and advisory boards of several major companies and organizations. He was a member of the managing board of Volkswagen, in charge of environment and traffic matters and, in particular, the implementation of an environmental strategy within the VW group worldwide Before becoming involved in management education, he was active in German politics. He was Minister of Economics and Technology in the State of Hesse with particular responsibility for transport, traffic, and energy. Before that, he was a member of the German Bundestag, specializing in energy, technology, industry, and foreign trade issues. Wolfgang Amann is a Fellow in Strategic Direction and International Business at Henley Management Centre,UK. He joined Henley from IMD, and has also been visiting fellow at theWhartonSchool and Indian Institute of Management. Prior to pursuing his PhD he worked for DaimlerChrysler and subsequently in management consulting. He has directed, delivered and contributed to open and in-company programs and courses on strategy, internationalization and governance in the US, Europe, China and India. His recent case study series on Hindustan Lever inIndia won the 2006 Oikos sustainability case competition.